Soft cotton material,long lasting durable,can be washed by machine,no fade no shrink.Fit for any season. Lovely,cute floral lace pattern,match most of home decor,add your home warmer and more comfortable.2 OR MORE are recommended. 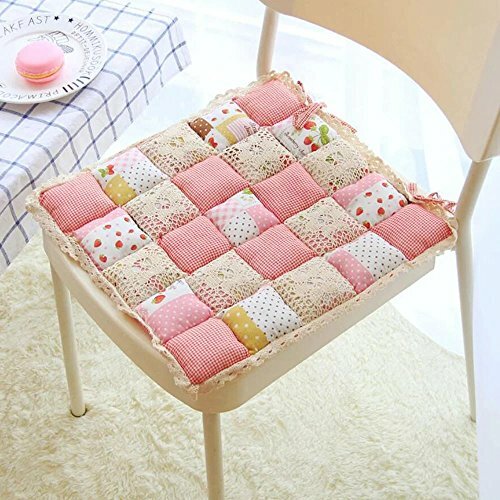 Back side with tie, keep the chair pad in place.Make you feel comfortable and relax after heavy work. 3-clorful type be choosen.A perfect decor for your office home and car.Suitable for indoor/outdoor travel or drinving. 1,The product you receive might be slightly difference with the photo due to the different screen. 2,Hand controlled sewing,the size might be 1% bigger or smalle is permitted. If you have any questions about this product by Cozyhouse, contact us by completing and submitting the form below. If you are looking for a specif part number, please include it with your message. ChezMax Cotton Linen Cushion Bird Pattern Square Decor Pillow Decorative Throw Pillow 18" X 18"